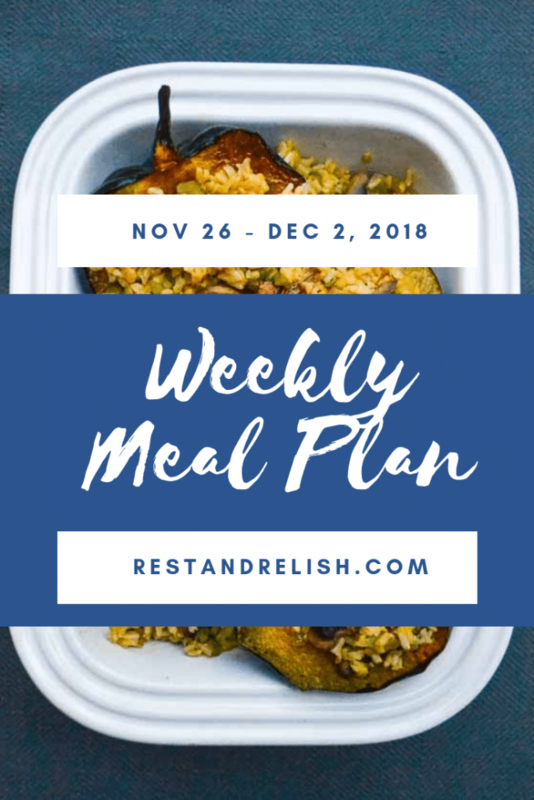 Thanks for following along for another Rest & Relish Meal Plan post. Did everyone have a nice Thanksgiving? Are you ready to kick the carbs to the curb for the next week? This week we are again going low-carb/no carb due to my husband’s marathon on Saturday (and that carb-heavy holiday we just celebrated!). We’ll continue to add extra carbohydrates for the kiddos! Feel free to alter or switch days around in the meal plan to suit your own scheduling needs! Stuffed Acorn Squash with Sauteed Spinach. Stuffed Acorn Squash was a big hit for the adults (not so much for the children!). I plan to swap the rice for quinoa to increase the protein and reduce the carbohydrates this week. The kids will have plain roasted acorn squash with some chicken sausage on the side. Keeping it real folks! Coconut Curry. We love curry night! Saute your favorite spices with diced onions, tomatoes and vegetable stock. Add your favorite protein (we love tofu!). Steam your favorite vegetables. Serve the curry over the vegetables and garnish with cilantro. Grilled Salmon and/or Chicken over Salad. Salmon is such an easy weeknight protein! Brush with a little olive oil, salt and pepper and grill for approximately two minutes per side. I love simply prepared salmon over a bed of arugula drizzled with lemon juice. If someone in your family does not like seafood, this is my go-to chicken recipe! Vegetable Stir Fry. As I’ve mentioned in the past, Thursdays are a great day in the week to see what vegetables you can round up before anything goes to waste. Once you have gathered your vegetables, toss everything together for a quick weeknight stir fry. Add your favorite spices and voila! Cook rice for your carb-loving peeps! Burger Night. Burger night with a twist in low-carb spirit! We cannot wait to try Skinnytaste’s Salmon Burgers. Our boy will have his favorite Bacon & Cheddar burger from The Fresh Market. It pains me to even type it, but he loves it! Crockpot Dinner. Well, surprise, surprise! We are not having Snack Supper Sunday. Mostly because the hubs and I are out at a charity event and the grandparents would probably not approve of cheese & crackers for dinner…eek! I’ll start a soup or one-pot meal in the slow cooker earlier in the day so dinner can be as painless as possible for them. Not sure of the exact menu, but I’ll peruse my Crock Pot Recipes Pinterest board for inspiration. In the meantime, we’ll enjoy some passed apps and support a dear friend that evening!